Tickets for the official warm-up fixtures ahead of the ICC Men’s Cricket World Cup 2019 are now on sale. To coincide with 50 days to go until the start of the ICC Men's Cricket World Cup, tickets for the warm-up games can now be purchased from the Official CWC19 Ticketing Website. 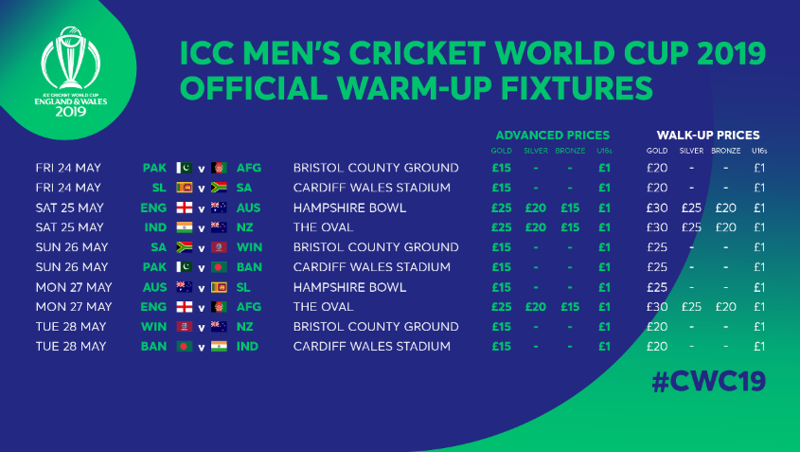 The warm-up fixtures will be held across four official CWC19 Host Venues: Bristol County Ground, Cardiff Wales Stadium, Hampshire Bowl and The Oval. As per previous ICC tournaments, warm-up fixtures will be 50 overs per side, but will not carry official ODI status, as teams can field all members of their 15-man squad during the match. The ICC Men’s Cricket World Cup 2019 warm-up games will be focussed on making sure the teams prepare as well as possible for the tournament. Therefore, fan activation around the host venues and cities will be minimal compared to what fans can expect during the tournament.